75305 is rated 3.5 out of 5 by 2. Rated 2 out of 5 by terrianneft from Delta Shower Head This shower head has little pressure and seems to have only one speed. Rated 5 out of 5 by Evie from Hand held shower head Perfect for the elderly person to hold onto while in the shower. The details do not list any dimensions of the head nor does it list what the spray settings are. I would need that to make a decision, and have to do that within a day or two, so I would imagine I will not hear back in time. Some websites have consistent information all the way across. In other words, for each item, all of the information is given, including drawings. The Delta website is more difficult to navigate and sometimes leaves out all detailed information, giving only sales pitches for the product. Thank you for your question. 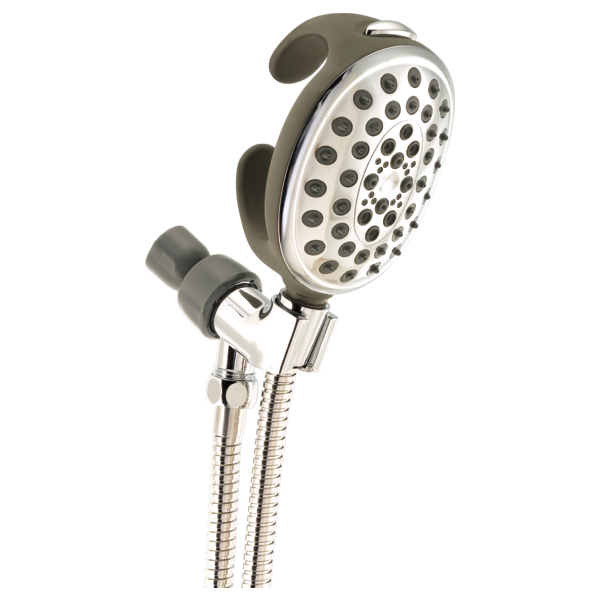 Delta Faucet model # 75305 is a palm shower that is 3-1/2 inches wide and 5-1/2 inches long. It has 4 settings which are: Pause, Fast Massage, Full Spray w/Massage, and Full Body Spray. I appreciate you letting us know about the lack of information on this product and I will let our product team know about it.